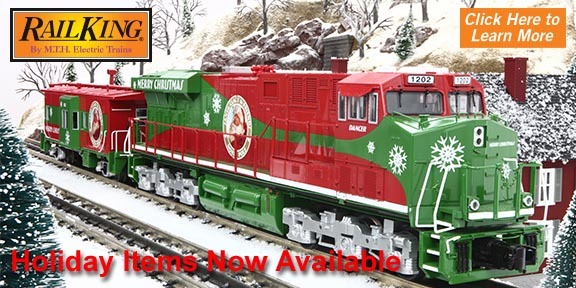 If you've been a fan of our Christmas-themed cars over the past ten years, then the 2017 locomotive and caboose set and selection of add-on cars in 2017 are the perfect way to build your very own Christmas train or bookend your Christmas car collection no matter whether you've got every car in the series or are just starting out. Add-on cars include lighted Christmas tree flat cars, TOFC Piggyback Trailer on Flat, a classic Santa box car and much more. All are featured in the list to the left and are available from many M.T.H. Authorized Retailers or if still in stock, by clicking on the Add to Cart button on each item's detail page. Just click on an item number on the left to start your search!